This was a scary welcome to the second act, after the first much more relaxing first half. 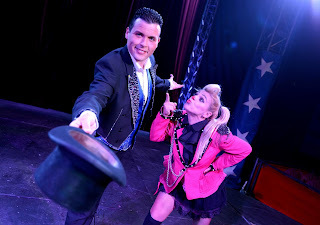 It works excellently and is credit to producer and director Mark Whitney that the show is perfectly balanced, with the bulk of traditional circus arts in the first half, while the more spectacular and often more modern feeling ones are in the second. Throughout the two hour show, not one act fails as they are all entertaining in their own way and never, perhaps more importantly outstay their welcome. The previous mentioned Wheel Of Death from the Eremia Brothers is perhaps the highlight for shear spectacle and certainly got the audience engaged. 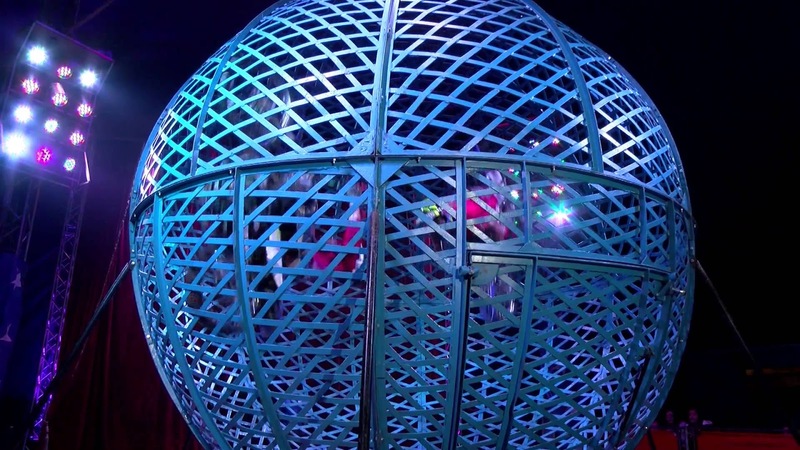 However the closing act of The Splitting Globe of Death goes some way in matching it, despite there only being three motorcyclists in there on this occasion. For me though, I enjoyed more the slightly traditional acts from the outset of the hula hoop and juggling performers and onto the omnipresent, but slightly less popular at this present moment, clown. 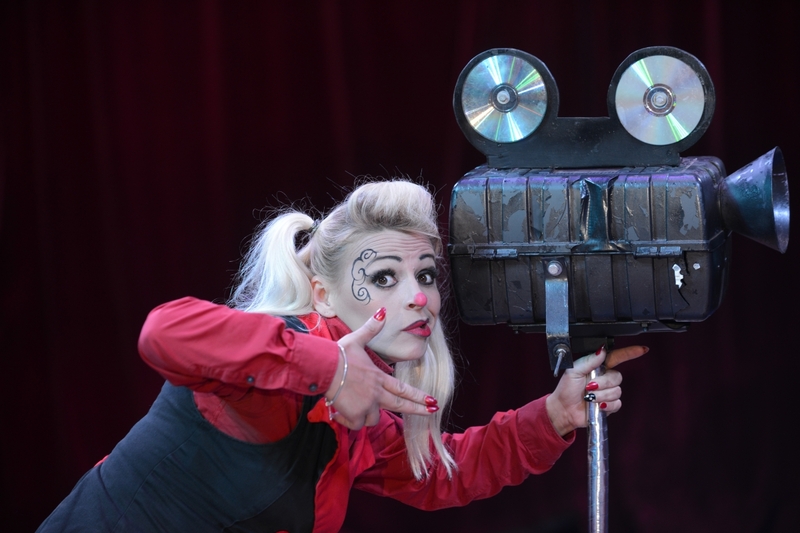 For this show, the bubbly and quite brilliant Andrea Delbosq is our clown, and she brings a more carefree and less threatening persona to the roll. Gone is the ridiculous costume with over sized feet that you might expect, and big red nose is cast aside to be replaced by a delicate blob of red make-up. 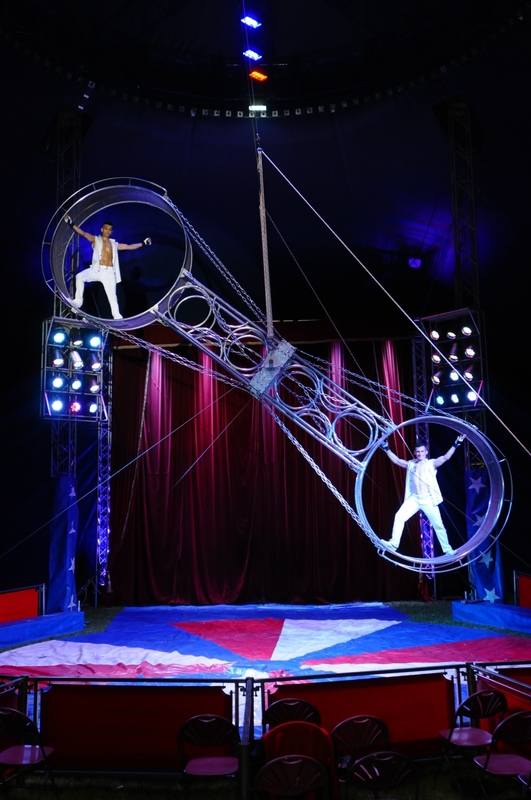 It creates a less perilous, but still very entertaining clown performance. While she attempts comically to get into the action in the first half, her main piece comes in the second half when with the help of the audience she creates a Star Wars themed movie scene. Audience participation can live and die on those selected, however the chap who played Luke Skywalker brought the canopy down with his performance. My only criticism perhaps would be that Andrea deserved to have a mic. It was however all entertaining and she is without doubt an excellently entertaining clown. Other highlights included an excellent routine from Australia and their lasso and whip-cracking antics, a male take on pole dancing, a death defying silk act and an impressive act from The Prince of Balance Emil. It all came together to form what was an impressive package of acts, cleverly organised for the best effect with excellent use of lighting and sound throughout. The tent itself remains a welcoming atmosphere from introduction to end, where you are able to meet every performer as you leave. These are excellently talented individuals, but who remain appreciative of their audience. No question that this genuinely comes recommended for children of any age. Performance reviewed: Wednesday 26th October, 2016 (matinee) at Billing Aquadrome, Northampton. Planet Circus OMG! runs until Sunday 30th October, 2016 at Billing Aquadrome, Northampton before continuing its tour.